There is very little point in holding on to the past. What is gone is gone. 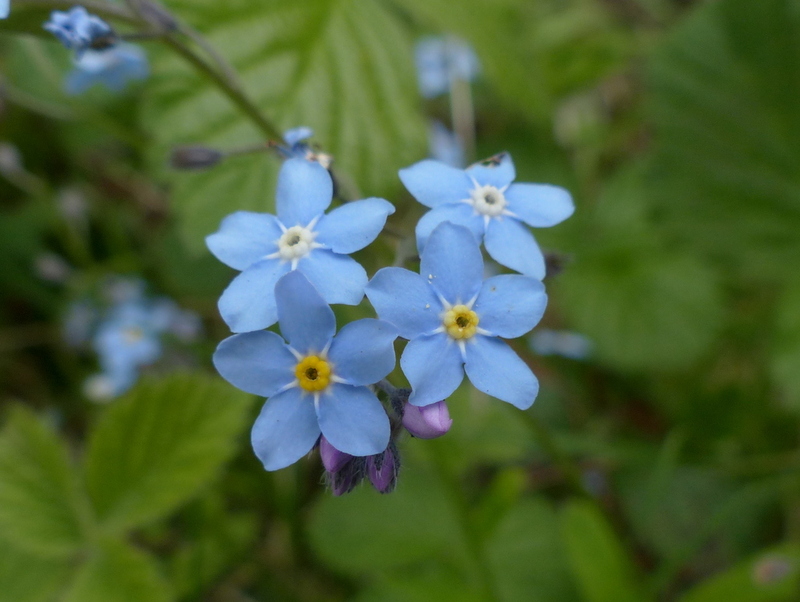 So my overly sweet and pretty little friend, you are a Wood Forget-me-do. 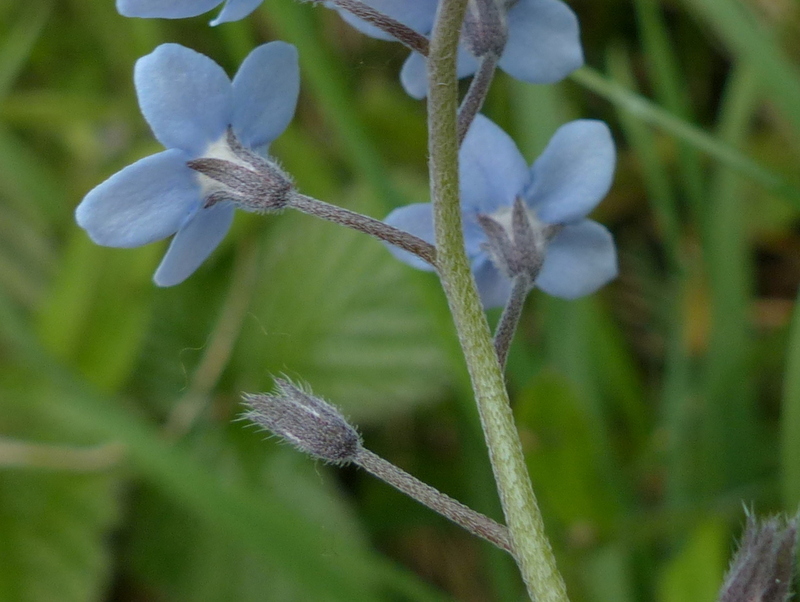 It is not always easy to get Forget-me-do’s to species, the Wood Forget-me-do is very similar to the field variety. A British pound coin has a diameter of 22.5 mm (about the size of a wedding ring, I guess)These flowers look about 7-8 mm across. 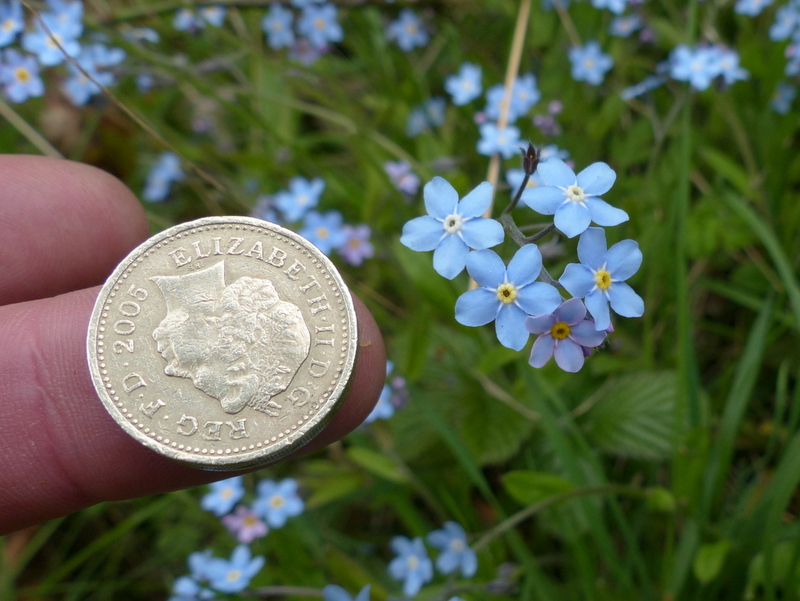 (Three to the pound) Field Forget-me-do’s are about half that size 3-4 mm. These flowers are also quite flat. The shape of the calyx pushes the petals of the Field flower up making more of a cup shape out of it. The calyx of the field variety is almost bell shape with the tips of the sepals closing to a point. The wood variety is more linear with an open end. In both cases the individual flower stalks are about twice the length of the calyx. That pedicle length is key to separating some of the smaller species and so it should be noted. Locally it is in flower now and you can see it in all the more open hedgerows as you walk into the village (dodging the devilish little lambs). 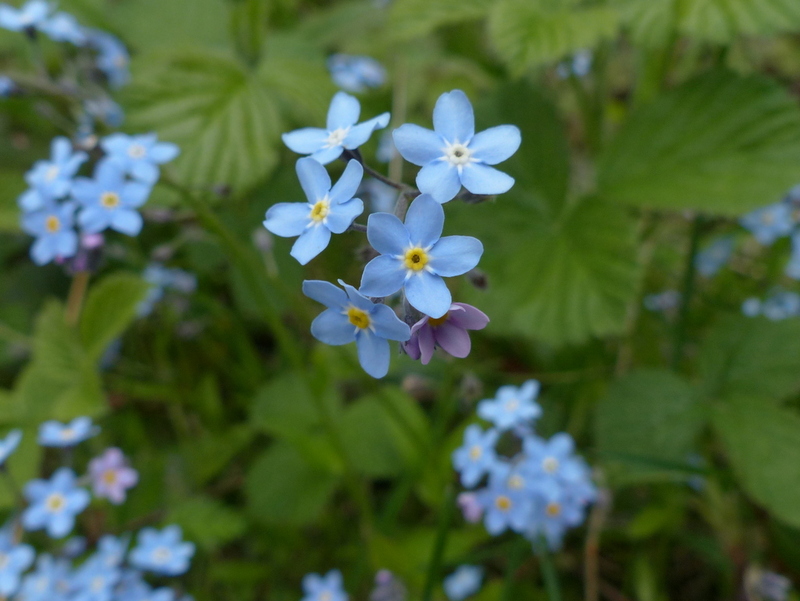 The large flower of the Wood Forget-me-do is the source of most of the garden varieties. Goodbye whatever your name was, I am afraid that it has gone again. I do remember that you were a very pretty little flower. How often I have found since following your blog the the tiny little flowers I used to walk over are such pretty little things. A beautiful flower to compare with new beginnings and letting go. Thank you for share. Have peace and be well. Thank you Sarasin 🙂 I spent a long time with my therapist yesterday and she said that, ” as long as the grass doesn’t get so long that we can’t find the ball, everything will be fine.” She is good. They are beautiful little flowers, of a wonderful shade of blue. Thank you John 🙂 I am finding it just a little bit tricky to separate the species but it will be worth the effort. Nature brings happiness and peace. Did you know that the yellow centres of this little whatya-call-it flower indicate that nectar is available, then the centres fade to white after the flower has been pollinated so that bees don’t waste their time visiting it. Thank you Emily 🙂 I hadn’t heard that but it sounds great. I had assumed that the pollen was yellow and when it was spent the anthers were white. That is very interesting because to avoid self fertilisation I would expect the flower to want to attract bees after it’s own pollen was spent. I will investigate that because there is often good reason behind these stories. Here’s the reference for it, I learnt about it while studying for a beekeeping exam – http://blog.mbbka.org.uk/category/education/bbka-module-2/ – see the top pdf, p.47. There are also lots of other flowers that change colour or shape after fertilisation, as the pdf explains, horse chestnut is another that changes colour and in clover the florets drop after pollination. Thank you Emily 🙂 This is something that I am really interested in and need to find out a bit more about. I am aware of the effect of authocyanidins that cause a colour change in leaves and petals and that in some flowers this indicates that the flower has aged and is beyond fertilisation. I keep seeing this information applied to Forget-me-nots and I am sure that this is misinformation. 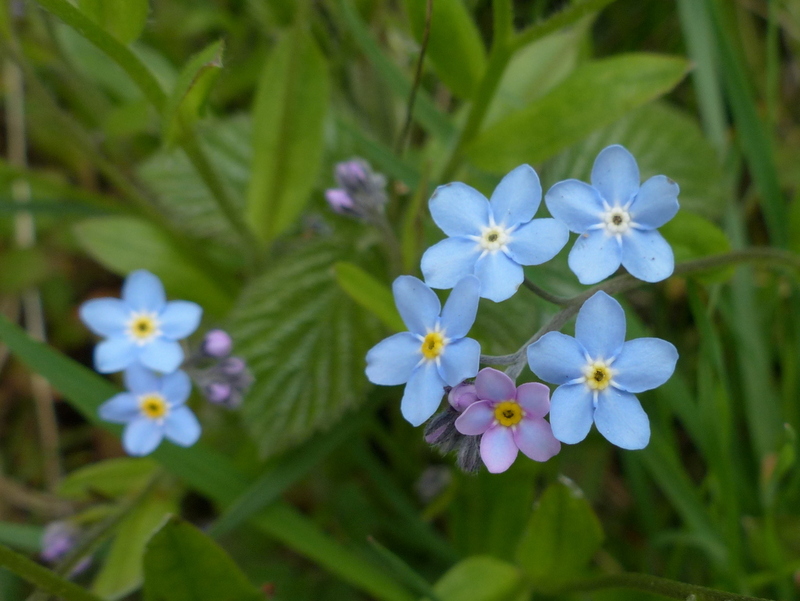 Forget-me-nots emerge from the bud pink but turn blue almost immediately, too quickly for it to be a sign that the flower is aged. People regularly post things on the internet and then others repeat it and misinformation spreads like wildfire but I trust my own eyes. That is information regarding colour change in petals and is not the same as your own account of the fornice ring changing colour to tell bees that the flowers are no longer worth visiting. I can not trace any scientific account of a chemical change in the fornice ring of Myosotis and I am searching Google Scholar. That just means that I haven’t found what I am looking for yet. but.. Another possible explanation for the change goes back to the pollen. 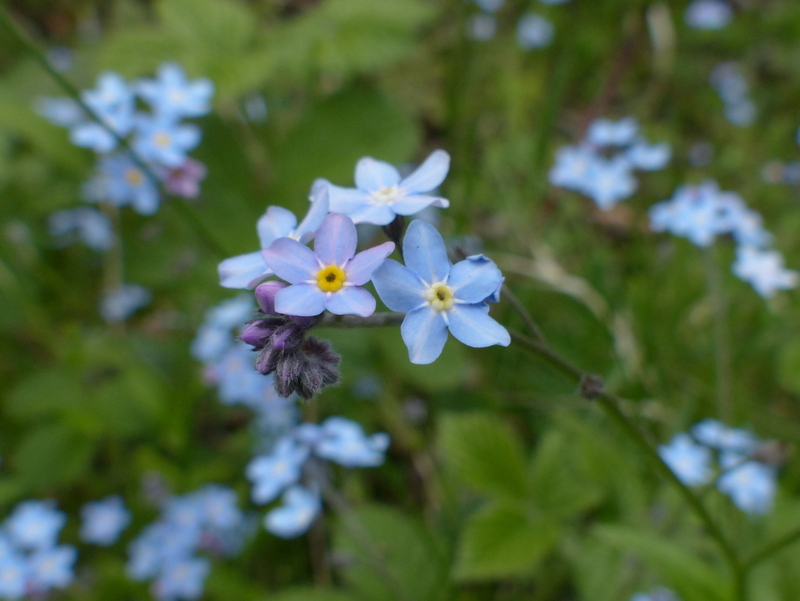 The pollen of Forget-me-nots is bright yellow and would display on the fornice ring. Once the pollen was spent the ring might turn white and that would indicate to bees that there was no more pollen and the flower was not worth visiting. Very pretty. I learn so much when I stop by over here. Thanks. Amazing coincidence. I found a FMN in the garden yesterday and I was struggling to get it to species level. I hadn’t appreciated how many there are. I’m still not 100% sure. I was distracted by moths this morning and I must go back to it. Very useful post. Thanks Colin. Thank you Andrew 🙂 It is a difficult subject. I had to go to the experts and found that I had initially got it wrong. The defining feature turned out to be the patent hairs on the lower part of the stem. They gave me a link to this video key. Thank you Becky 🙂 It is a lovely little flower. The blue are a favorite flower. I have pictures of Sagebrush and Mountain bluebells . Of course different species. I’m so very, very happy for you. And the flowers are beautiful. I like your twist of name, suits the moving on. 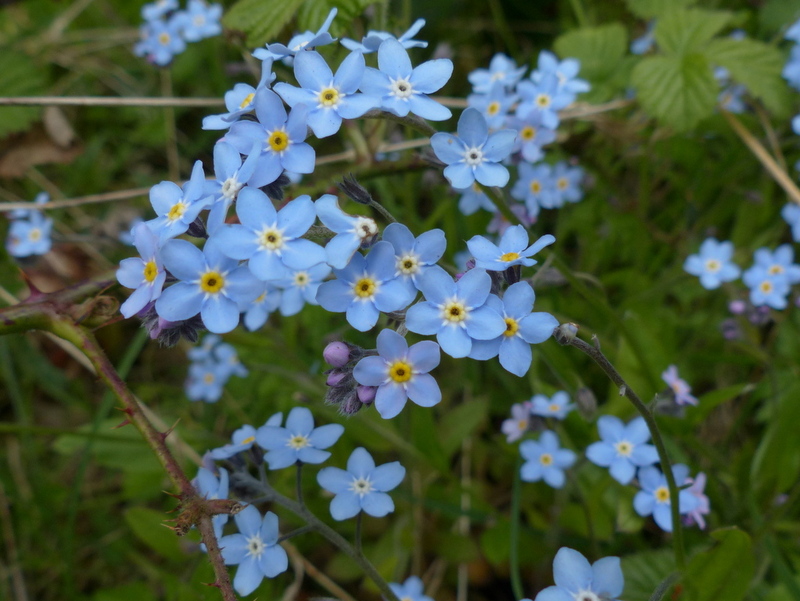 I know there are several species and many using the common name are not Myosotis, though I haven’t made as close a study as you. I have the spring blooming wooly M. sylvatica self-sowing madly in the garden, but my favorite is the smooth M. scorpiodes that grows near the streams and blooms in midsummer. It is considered invasive, but that is not my experience here. There are far worse interlopers like knotweed, honeysuckle and multiflora rose. Thank you Eliza 🙂 Agreed, it is a small and attractive flower and it doesn’t really overshadow anything. It can’t be that invasive. I am having trouble with the names, but the flowers are lovely. May your day go well. 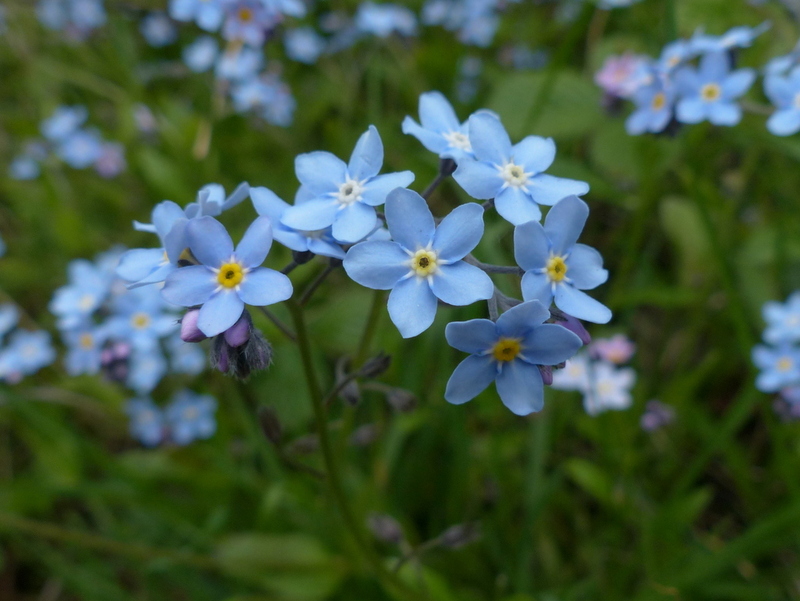 Beautiful photos of lovely forget-me-dos. This post will be very useful to me as I find telling the difference between them all so difficult. Letting go of the past and accepting the present is so hard to do when you have suffered as you have done. Once done it is like the sun coming out from behind a cloud. Thank you Clare 🙂 The video key that I posted in an earlier comment for Andrew is actually quite good if you can get around the jargon. I would like to find a way to make it easier. It all has to do with the flower’s hairy legs.